There is something to be said about those who thrive on change. A new opportunity transformed into an adventure by moving, or a fearless leap of faith, magically turned into change for the better at work, are all wonderful examples of great things that happen when you are able to benefit from change. Truth be told, I just have never been a big fan of it, in general. Now I am a realist, and understand that things cannot remain the same forever, but it sure is nice when you realize that some things don’t change. For the last 21 years of my life, my Birthday has basically been the same and I have to thank Nathalie and her family a tremendous amount for that. For as long as I have been with her, all but for one of these 21 years, we have spent it in Whitby at her parents place (one year her parents went to Curacao for Christmas!). Piles of presents fill the living room, with the sound of a crackling, well maintained Opa fire adding warmth to the room, and the joy that comes from taking turns opening presents, one at a time, one by one. Time spent to enjoy and acknowledge the feelings that each gift brings to each receiver. I get that there is something else happening on the 25th of December, that has a way of taking over things, but for me, the day always seems to be about me. Even my 3 year old niece CC, didn’t want to take a nap this year, saying she was too excited for my birthday! Nathalie and the girls always do a great job of making me feel special and reminding me throughout the day that Jesus may be the reason for the season, but it is little old me, that is the reason for the happiness on this day. P.S HAPPY birthday to my little twin sister also! I have spouted off at least three times over the last year or so, about the wonderful “Cake Artist” we count among our friends, Lisa Wong. Now, I get to brag about her again, because Thursday night, just after the kids went to bed, I got to answer the door to a surprise delivery for MY birthday. The whimsical nature, speaks directly to my heart, and I sometimes feel just like a snowman in, sitting around watching the world go by, waiting for a dog to pee on me. Thanks for the gift Lisa, and I am happy to say that it tasted just as wonderful as it looked! 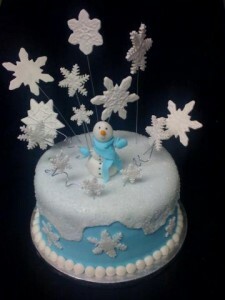 To order your own cake for any occasion, send her an email Bakergirl0029@yahoo.ca. This week Nathalie’s company had a pot luck lunch to celebrate the holidays, and it was also to raise some money to help one of the employees who’s daughter has been diagnosed with leukemia. Because I have been helping out with the redesign of the company website, I was able to crash the party, and sample some of the wonderful food prepared with care and love for the occasion and I felt special to take part in the day. Touching was witness to Carlos’s speech about his daughter and how moved he was to be working for such a wonderful company and working with so many caring people who donated money and purchased raffle tickets, all in support of his daughter. I LOVE that I received more then 50 wall posts and a couple of messages on Facebook, acknowledging my birthday, as well as several more email messages form various sites I have signed up for memberships over the years. Carnival Cruise lines sent me an animated card, NBA All-Access sent me a 15% off discount coupon, and 680news Insider club sent me 680 points for my fan club account. I even got a message from a site I forgot I signed up for on a whim, using an alias, wishing Jack “a Very Happy Birthday”. I love that people take the time to say hello and happy birthday at this busy time of year, even if it is some automatic message generated by some program, running on a server some place. It makes me feel special, and I just wanted to say a big Thank you to all those who sent along birthday wishes to me. I truly am blessed! This week, I felt a little like the guy in the boat, and what I thought I would see is some grand sign that my Mom was with us, celebrating Christmas as she always has been, but I saw nothing of the sort. No grand sign or big “Ahh ha” moment of her presence, instead I realized that she WAS with us in the tradition, and smiles, and laughs and stories we all told about her over the last couple of days. All this, in of it self IS a sign that she WAS with us and for that I am truly grateful. Merry Christmas to all and have a great New Year! Next blog, the year in review!